Proceeds from this event go towards academic scholarships for area high school girls as well as other community-driven NCBW initiatives. 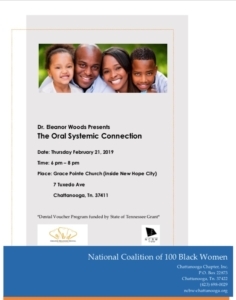 In an effort to continue its health and wellness efforts, the National Coalition of 100 Black Women, Chattanooga Chapter, Inc. (NCBW) is co-hosting The Oral Systemic Connection. 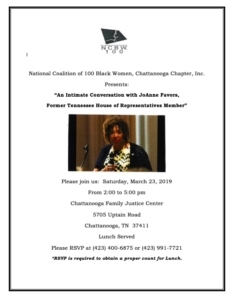 Dr. Eleanor Woods will be the guest speaker for the event scheduled for Thursday, February 21, 2019 from 6P-8P at Grace Pointe Church, 7 Tuxedo Avenue, Chattanooga, TN 37411. The symposium is part of NCBW’s Dental Voucher Program and funded, in part, by a state funded grant. 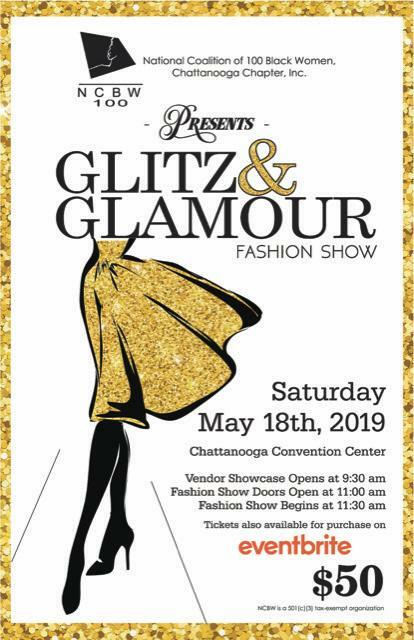 Tickets are also available for purchase at Chic’s Beauty Salon on Brainerd Road. Individual seats are $55 each. For reserved seating, purchase a table of 8 for $440. For more information, please call us at 423-698-0029. Get your tickets early. Space is limited! 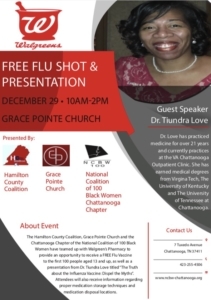 The National Coalition of 100 Black Women, Chattanooga Chapter, Inc. is partnering with The Hamilton County Coalition, Grace Pointe Church and Walgreen’s Pharmacy to provide an opportunity for the community to receive FREE flu vaccinations to the first 100 people ages 13 and up. This event is scheduled for December 29, 2018 from 10A-2P at Grace Pointe Church which is located at 7 Tuxedo Avenue Chattanooga, TN 37411. In addition to the free vaccine, our very own Dr. Tiundra Love will be on hand to talk about the myths associated with the influenza vaccine. 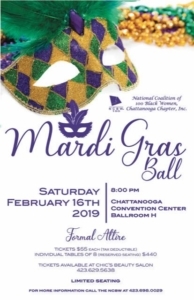 For more information regarding this or any other event, please feel free to call 423-255-4506.
http://www.ncbw-chattanooga.org/wp-content/uploads/2018/07/ncbw-logo-h-2.png 0 0 ncbw http://www.ncbw-chattanooga.org/wp-content/uploads/2018/07/ncbw-logo-h-2.png ncbw2018-12-20 18:06:592018-12-20 18:06:59FREE Flu Shots... And Other Important Health Information! 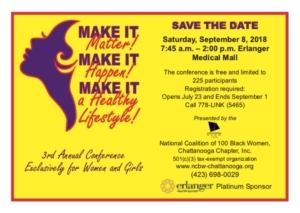 The National Coalition of 100 Black Women, Chattanooga Chapter, Inc. (NCBW) is hosting its annual Make It Matter! Make It Happen! Make It a Healthy Lifestyle! health and financial wellness conference for women and girls. This year’s event will be held at Erlanger Baroness Hospital Medical Mall on Saturday, September 8, 2018 from 7:45 a.m. to 2:00 p.m.
Each year roughly 200 women and girls, ranging in age from 12 to 90, attend the conference. The goal is to present information relevant to issues facing women and girls today. From recognizing and understanding mental health, identifying sexual harassment and domestic violence to bullying, conflict resolution and financial well being, the day will be full of information women and girls in our community will find useful in their daily lives. 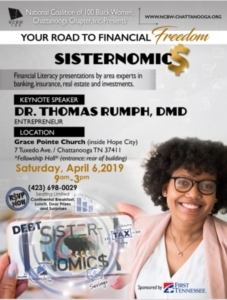 In order to create an environment that cultivates and encourages women and girls to speak openly and honestly about their health and financial wellness concerns, we have only invited female presenters, speakers and exhibitors. The conference is free and limited to 225 participants. Pre-registration is required. Registration is currently open and ends September 1. All interested women and girls may pre-register by calling (423) 778 (LINK) or (423) 778-5465. Walk-ins will be accommodated if space permits. Minors will require written permission from a parent or legal guardian to attend the conference.